The league proper ended with a very tight game where the individual skills of the Tullamore players saw them over the line. Kilkenny played very well and will be very annoyed to have let his one slip, as they were leading with 15 minutes to go having played most of the game in the Tullamore half of the pitch. 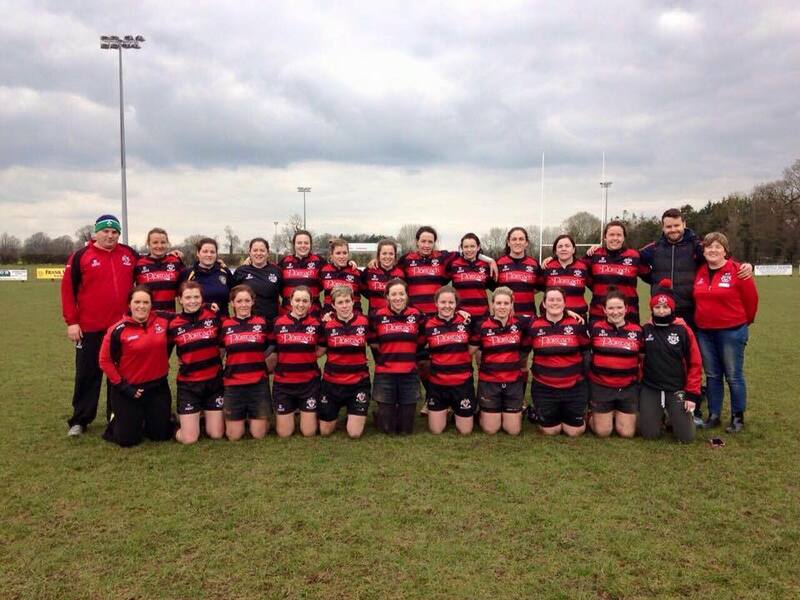 CYM did enough in their victory over North Midland Falcons to ensure a home semi-final against Tullow. The winner of that game will be Tullamores’ opponents in the Final in Donnybrook. The game on Sunday was played in ideal conditions for rugby, and the pitch was a credit to the Kilkenny grounds man. Tullamore started with an experienced team, and knew Kilkennys capabilities, however a number of uncharacteristic errors such as missed tackles and poor options been taken resulted in most of the first 40 minutes being played in the Tullamore half of the pitch. An Injury to loosehead prop Alma Egan may have unsettled the team, as they were well below their usual dynamism. Having said that, the home side only once looked like scoring a try, and the Tullamore girls put up a stout defence holding up a ball under the posts, and then using an excellent exit strategy to bring play back to the half way line. Kilkenny did get an opportunity for a kick at goal, and the player in black and white showed that she was well able to strike the ball as she converted the penalty for a 3-0 lead after about 30 minutes. Tullamore finished the half strongly with some good carries by Evelyn Browne in particular, and if there was a couple more plays before the whistle, they may have scored themselves. At half time, the girls regrouped, and the feeling was, that they hadn’t performed to their usual high standards, and that with 40 minutes to go, they should pick themselves up, and get back on top in the game. Kilkenny though, had the scent of victory in their nostrils and weren’t going to make life easy. The game was played largely between the two 22’s, although Tullamore looked slightly more dangerous when their passes stuck. The try eventually came after 65 minutes, by getting the ball out wide where Emer Phelan made good ground before passing to the speedy Chloe Lowry who increased her seasons try tally by scoring under the posts. Pauline Keating added the extra points and now Tullamore were gaining confidence and looking to kick on. Tullamores change in attitude was especially evident by the introduction of Vicki Cobbe who had a fantastic game, and Kilkenny never really looked like scoring after the Tullamore try. The feeling after the game should have been one of jubilation, however this group know that topping the league is only half the battle, and in order to be claimed league champions, Tullamore will have to win the final, and a performance similar to Sundays, may not be good enough. The girls also realise of course that there is room for improvement, and that a win against a good Kilkenny team, while playing below par is no mean feat. New Ross will provide the next opposition in a cup match to be played in Spollanstown. Check out www.tulamorerugby.com for the latest details regarding dates and kick off times.